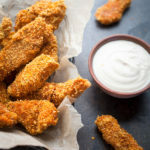 This kid-friendly recipe for almond-crusted chicken fingers with honey-mustard dipping sauce is great for adults, too! A light almond- panko crust bakes to a crisp, golden exterior, and the honey mustard sauce has the perfect blend of sweet and tangy. 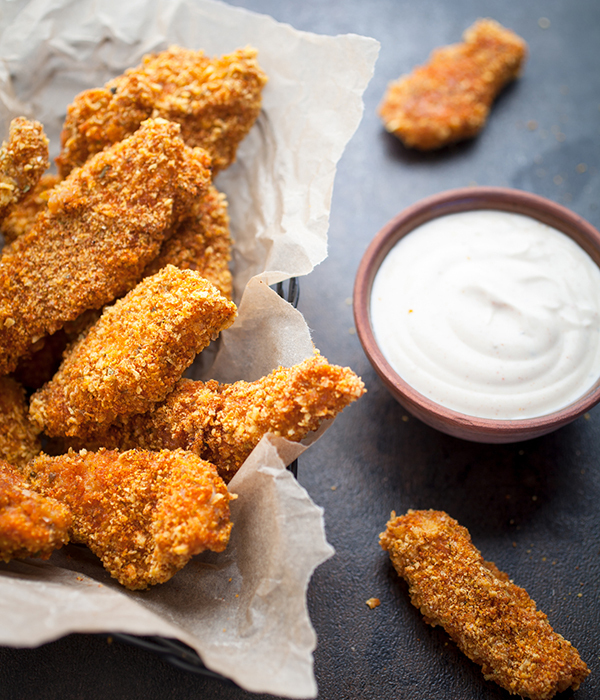 These Almond Crusted Chicken Fingers with Honey Mustard Dipping Sauce are great for kids and kids at heart! Combine honey, mustard, and vinegar in a small bowl; mix well. Chill. Combine eggs and water in a medium shallow bowl; whisk to blend. Soak chicken in egg mixture for 30 minutes, turning once; set aside. Combine bread crumbs, almonds, salt, and pepper in a large resealable plastic bag; shake to combine. Working with a few pieces at a time, lift chicken from egg mixture, letting excess drip back into bowl, and drop into bag containing bread crumb mixture. Seal bag and shake to coat; repeat with remaining chicken. Place chicken on prepared baking sheet. Bake for 18 to 20 minutes, turning after 10 minutes, until no longer pink in the middle and golden brown. A protein and FFC as part of lunch.